Spider House, an upcoming malayalam movie directed by Sanjeev Babu is all set to entertain the audience. Produced by Shaji Ettumanoor under Sonic Group banner, the movie will have a star cast with new faces. The movie is based on a love story revolving around a haunted house. Read more about 'Spider House' which is expected to release soon. Interesting stories and names are not new in malayalam film industry. New generation film makers are on the way discovering innovative themes which would keep the audience intact. Yet another movie is under preparation behind the screen coupled with an interesting story. 'Spider House', directed by Sanjeev Babu, touted as a thriller which is getting ready to entertain the viewers. Through 'Spider House', Sanjeev Babu would be introducing many new faces. Vishnu Vijay, Naveen, Hunaif Hussain, Sini Varghese would give life to main characters in the movie while a bunch of young actors would make their debut on big screen. Shooting of the movie was major carried out in Thiruvanathapuram. Sanjeev himself has lent his support as the script writer and also has set the tunes for the movie. 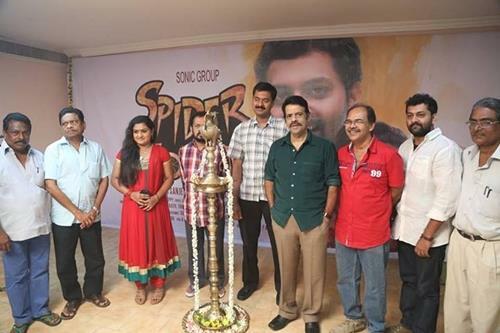 The movie is produced by Shaji Ettumanoor under Sonic Group banner. Jose Alleppy has stayed behind the camera as the major still photographer. 'Spider House' is based on a love story revolving around a haunted house. The film maker has given his best to mold the movie which would entertain the movie lovers. There will be five songs in the movie including a fast number sung by Jassie Gift. Sanjeev Babu is known in the industry as a music director who has set tunes for movies like Videshi Nair Swedeshi Nair, Kakhinakshtram and The Car. Much interestingly Sanjeev had shown this talent playing the guitar nonstop for more than 24 hours. He already had created his name showing his musical skill through All India Radio and Doordarshan Kendra.